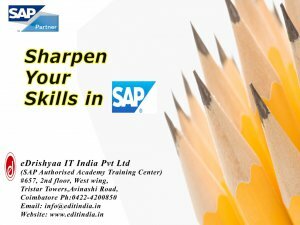 Ø The only SAP AUTHORISED TRAINING CENTRE AT COIMBATORE . Ø Specialized only in SAP Training without any diversions. Ø Direct Certification from SAP AG Germany. Ø Flexible batch timings, so, your daily schedules don’t get disturbed. Ø Study material Directly from SAP. Ø 100% Job Assistance provided. Ø Bank Loan facility available with easy EMI.